According to Crysis 2, one of the biggest shooters coming to consoles and PCs this fall, there will be two ways to save the Big Apple in early September of 2023: Like a predator; or like a tank. 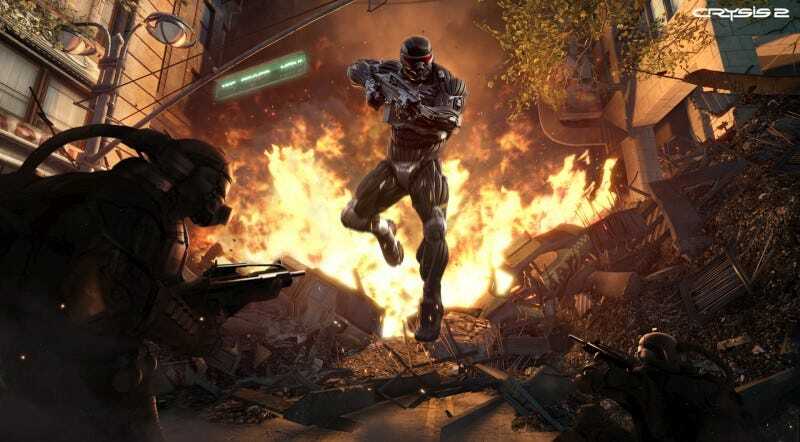 Developers from German development studio Crytek came to the New York City of 2010 this week to show off a playable version of the more bombastic, more streamlined — but, they say, not at all dumbed down — sequel to the PC-only first-person shooter Crysis. In a demo running on Xbox 360 hardware, they controlled a super-solider from a first-person perspective, using Crysis 2's Nanosuit 2.0 to toggle between two main modes, predator and tank, to take on crafty black ops human enemies and then to try to fend off an overwhelming tide of Ceph aliens descending upon Manhattan. The first game's Nanosuit, which toggled between four enhancements — enhanced armor, strength, speed and cloak — has been altered/upgraded/streamlined to allow the player to toggle between what Crytek CEO Cevat Yerli described to Kotaku as the tools to let Crysis 2 "be an action game or a stealth game." That's how players wound up playing the first, he said, oscillating between the two modes of play. One main mode of the suit will enable stealth tactics, improving the player's ability to sneak up on enemies and, as we saw during a sequence of the demo that occurred on a rooftop in downtown Manhattan, see through walls at close quarters to spot enemies. The more aggressive mode will draw more fire but make the player more powerful. "The player chooses it but then the player toggles on top of it the power or tactical modes," Yerli said. "He can stealth-run, stealth-jump or stealth-assess. He can tank-run, tank-jump or tank-assess." Beyond that, new powers will be added and can be combined, unlocking new abilities that enhance one of those two ways a player might play, a simpler first tactical choice leading to more varied long-term outcomes. The first Crysis had a reputation for all but melting PCs, running best on high-end hardware that costs a few paychecks. But the new Crysis 2, even when running on an Xbox 360, looks quite nice in its own right. The game's New York appeared crisp, the Chrysler building gleaming in the background of the scene we saw, an intersection densely with the detail of detailed buildings, street detritus and enemies. The demo began with the lead character engaging black ops soldiers on a rooftop battle. New York had become a warzone, all but abandoned by civilians but full of what they left behind, wrecked. This future New York is a little more green than the current one. It's a place with more rooftop gardens and ivy climbing walls, though still a far cry from the jungle of the first Crysis. Enemies on the rooftop seemed smart and cover was a vulnerable thing. Concrete tree planters chipped and crumbled when hit by gunfire. The plot of the new game involves saving New York, a city Yerli described as "the pride of mankind," a place of landmarks that dramatic, unannounced things will happen to. The Black Ops guys may be adversaries. Apparently our character has something they want back. But Crytek is not saying what that is. And, halfway through the demo, it didn't matter. Despite a Crytek developer's adept switching of guns and toggling of suit powers, the enemy gained the advantage. The Black Ops had gained the upper hand and arrested our hero, but the chopper we were being brought away on was hit by something. Suddenly our character was lying in the streets, witnessing an assault by massive Ceph aliens. The suit revived our hero and we were back in the fight. Crytek is promising a more action-packed sequel and one with the focus that will match the expectations of finicky console players. But Yerli insists that neither the suit nor the flow of the action will be dumbed down. The first game was celebrated for offering tactical variety and the developers of the new game maintain that that is back in the new one. In fact, they say it is enhanced by the sheer amount of stuff they can put in a city scene with which you can interact. So, as demonstrated before Kotaku's eyes, the game's hero can shoot at enemies but also toss newspaper boxes at them, blow up cars, and swing lampposts. We were told that punching cars will trigger airbags, the tactical value of that not entirely clear yet. Hot dog carts, can either be tossed or detonated. Think of it, the Crytek people said, as an urban jungle. The Ceph were too much in this demo. So impressive were they that a pod landed, destroyed the side of a building and out rumbled an even more massive alien that blasted hero and demo to a cliffhanger conclusion. What Crytek had shown was not terribly original in execution but advanced visually and exciting in its thunderous volume and avalanche pace. The variety of play looks to be as flexible as advertised. The new game does have some narrative connection to the first, though the developers are not spelling that out. Knowledge of that first game won't be required, so console players, who never had a chance to play Crysis or the spin-off Crysis: Warhead won't feel left out. But there will be some as yet unexplained character connections. The big draw here is an advanced first-person shooter set in a near-future New York under siege. The echoes of September 11 are clear. The urge to save the city is strong. The move to a console-friendly style of development does not appear to shatter the Crysis formula, but it has indeed been tweaked, the better for all players, Yerli maintains, and the better to save a city that is once more under attack. The game is set for a late 2010 release on PC, PlayStation 3 and Xbox 360. The game is developed by Crytek and published by EA.